2. Lightly spray oil on two regular-size 12-cup muffin tins or two large 6-cup muffin tins. 3. In a large bowl whisk together the flour, ground flax, baking soda, cinnamon, nutmeg, ginger and salt. 4. Make a small well in the center of the dry ingredients and add the honey, eggs, vanilla and applesauce. 5. Stir the ingredients together until just combined and there are still some spots of flour remaining. 6. Fold in the shredded carrots and cranberries just until combined (don't over mix or the muffins will be dense). 7. 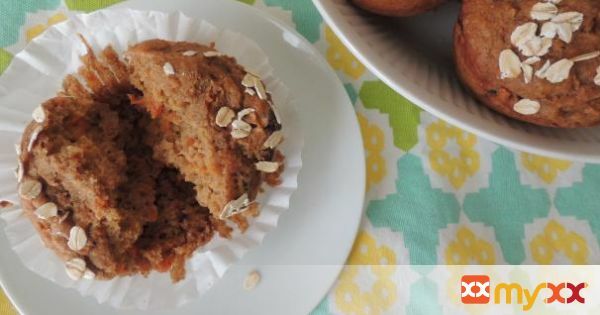 Distribute the batter evenly among the muffin tin cups and sprinkle some oats on top. 8. Bake for 20-24 min for large muffins (mine came out perfect at about 23 min) or 18-20 min. for regular-size muffins, until a toothpick inserted in the center of a muffin comes out clean. 9. Remove to a wire rack to cool completely, Enjoy right away or make extra to freeze for a quick snack!